Hillary Rodham Clinton's inside account of the crises, choices and challenges she faced during her four years as America's 67th secretary of state and how those experiences drive her view of the future. 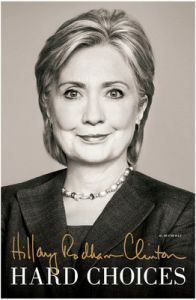 "All of us face hard choices in our lives,Hillary Rodham Clinton writes at the start of this personal chronicle of years at the center of world events. "Life is about making such choices. Our choices and how we handle them shape the people we become." In the aftermath of her 2008 presidential run, she expected to return to representing New York in the United States Senate. To her surprise, her former rival for the Democratic Party nomination, newly elected President Barack Obama , asked her to serve in his administration as Secretary of State. This memoir is the story of the four extraordinary and historic years that followed and the hard choices that she and her colleagues confronted. Secretary Clinton and President Obama had to decide how to repair fractured alliances, wind down two wars and address a global financial crisis. They faced a rising competitor in China, growing threats from Iran and North Korea and revolutions across the Middle East. Along the way, they grappled with some of the toughest dilemmas of US foreign policy, especially the de-cision to send Americans into harm's way, from Afghanistan to Libya to the hunt for Osama bin Laden. By the end of her tenure, Secretary Clinton had visited 112 countries, traveled nearly one mil-lion miles and gained a truly global perspective on many of the major trends reshaping the landscape of the twenty-first century, from economic inequality to climate change to revolutions in energy, communications and health. Drawing on conversations with numerous lead-ers and experts, Secretary Clinton offers her views on what it will take for the United States to compete and thrive in an interdependent world. She makes a passionate case for human rights and the full participation in society of women, youth and LGBT people. An astute eyewitness to decades of social change, she distinguishes the trend lines from the headlines and describes the progress occurring throughout the world, day after day. Secretary Clinton's descriptions of diplomatic conversations at the highest levels offer readers a master class in international relations, as does her analysis of how we can best use - smart power to deliver security and prosperity in a rapidly changing world - one in which America remains the indispensable nation. Hillary Rodham Clinton served as the US Secretary of State from 2009 to 2013 after nearly four decades in public service as an advocate, attorney, First Lady and Senator. She is the author of several bestselling books, including her memoir, Living History and her groundbreaking work on children, It Takes a Village.